Dye Verse UK: Twas on a Monday morning…. Twas on a Monday morning…. Morning one and all, and again a big welcome to all my new corporate followers – I hope you find something within this blog to inspire and cheer your working day. Well what am I up to – a very good question. I have The Mediaeval Dye Pot by Dee Duke on my desk at the moment. I love this pamphlet being available as a reference, as it not only gives me some useful starting points for recipes, but the history behind the dye plant as well. I am thinking of planting up a small dye/herb plot this year – as the whole of the decking area needs rethinking and reshaping after the winter storms. There are other ones in the series that I have, and one I really should have considered buying - Dyer in the Garden. I have other books on the subject but they are American, and I could do with an English take on our weather and our cultural dyeing history. On the subject of Englishness, I have just discovered a new English craft Podcast A Playful Day. I really struggle with American podcasts as they seem to – and this is a very generic statement here – just meander around the plot and do a lot of high pitch giggling when they can’t think of something to say. There are some exceptions to this, but I am struggling to find them. I love podcasts whilst I am knitting and spinning, but have gone off track a bit lately with them. I think I shall write a blog about my favourites when I have a moment. So all this rambling has just reminded me about the confuffle which had surrounded the Dyeing Day last September and my rather disappointing and headscratching out put, and could explain why I am so confused…! Heavenly Clouds charts where I ended up with my experimentations. 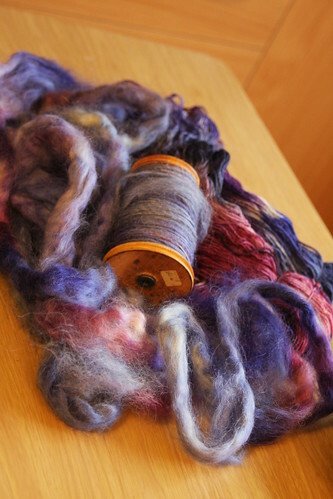 So it was Massam, and the wool I had originally dyed with was disposed of. But I do think this goes to show that there is no such thing as a “mistake” or a disaster in dyeing exploits – and that is certainly the way I approach my dyeing experiments, with a sense of joy and fun and not quite sure where I am going to end up! I could have simply walked away and not questioned why the dyes had not fixed, and put it down to experience – but I didn’t and some very lovely people came forward to assist generously sharing their knowledge. Without this episode having taken place, I would never have questioned the science and theories behind acid dyes, and not have made the next leap to natural dyeing which is currently giving me so much joy. (as an aside - I have just signed up to the take the Guild Certificate of Achievement – which I never thought I would in any month of sundays!). and working my way through an excellent sample that I purchased through Fibreholics sample bags. Not sure which round. 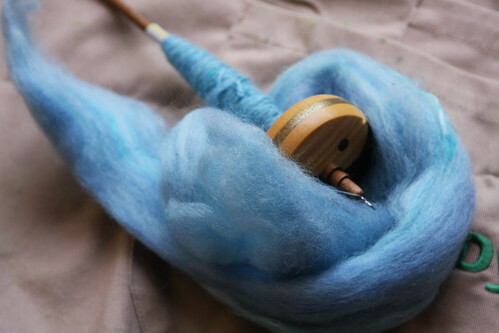 This one came from Spinning a Yarn and having just taken a quick look at the FH site she doesn’t seem to be a current contributor – shame as it is an excellently prepared and interesting top to spindle spin. I am totally immersed – drawn in by the subtle colour changes and as it is prepared so well, very little in the way of stoppages….so I can keep my spindle spinning..
Back to finishing of Bruce's socks again – these have taken an age as I keep getting distracted by…little things like Lauren's Jumper. I have now finished the sleeves of this, and all that needs doing is sewing together and then a colour. I am also doing some more on my Barn Raising Quilt, as I have now sewn a lot of the outstanding squares together and have a clearer idea of what colours are now needed. I am looking to start another project within the next few days, but don’t want to say anything until I have pinned down the measurements required. Unfortunately poor French Shabby Chic has stalled on the loom. I have woven no more since I was getting myself sorted out over the Court Case. I found this a real shame as I had wanted to take it to the Heritage Crafts Conference to put in their “instant” gallery as a demonstration of how weaving is organic and develops from idea to finished product – with ever changing decisions having to be made along the journey. Unfortunately, even though the details of Spinners, Dyers and Weavers were showcased, there were no examples of tactile textiles, which was a bit of disappointing. 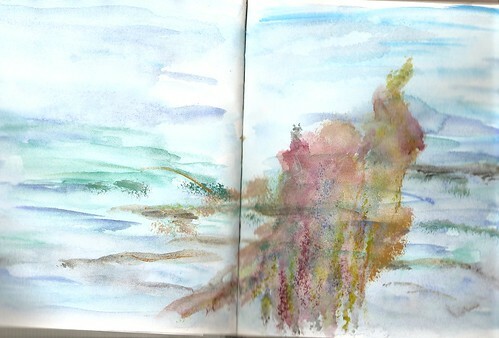 I did though sketch this yesterday whilst playing with watercolours and thinking about Sea Goddesses… so I can feel some funky colours, and art yarn distilling inside me. So off to create some colour and not just think and write about it…. Thanks for commenting on my blog, I love yours - so glad to have found it. 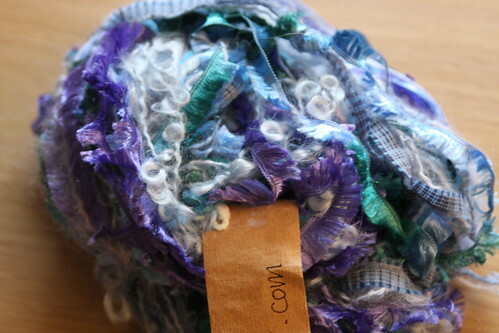 Looking forward to seeing what you do with that textured yarn!